Teeth in 1 Day Seminar came to the Ayres Hotel Laguna Woods July 7, 2018. Full house at the seminar with attendees from all over Orange County. Laguna Woods, CA - Cunning Dental brought their popular Teeth in 1 Day Seminar to Laguna Woods, CA on July 7, 2018. It was a packed house with a lot of patients interested in looking for a permanent solution with same day dental implants to their dental problems. Dr. Cunning is making an effort to reach more patients by taking the seminar to other locations. In the past he has gone to Burbank, Manhattan Beach, Newport Beach, Palm Springs, San Diego and now Laguna Woods. Patients that need dental work can now learn about all the dental treatment options available at Cunning Dental. Dental implants are proven to help stop bone loss. There is hope for patients that are suffering from it. Whether they lost teeth or wear dentures, Cunning Dental has advanced 3D CT Scanners that can help detect bone. In order to be a candidate for the Permanent Teeth in 1 Day procedure we need to find bone to attach the 4 dental implants per arch. Once we find enough bone then the precise surgery will attach the new teeth to 4 dental implants. Patients will now have a fixed, dental solution that will help them stop the bone loss. Teeth in 1 Day allows you to confidently bite into an apple! After a few months of healing patients regain 60-90% of their chewing capacity. What does that mean? It means that hard foods that they had to give up when they lost a lot of teeth or because of loose dentures are now options again. Chewing on apples, sandwiches and steaks are now possible. If you are suffering from bone loss and think there is no hope do not give up. Please call us at (855) 328-6646 today to see if you are a candidate for the Teeth in 1 Day procedure. Attendees of the seminar were able to meet the man himself, Dr. Cunning. He is known to be the nicest man around and patients got a first hand look since he went around the room to say hello to each person. 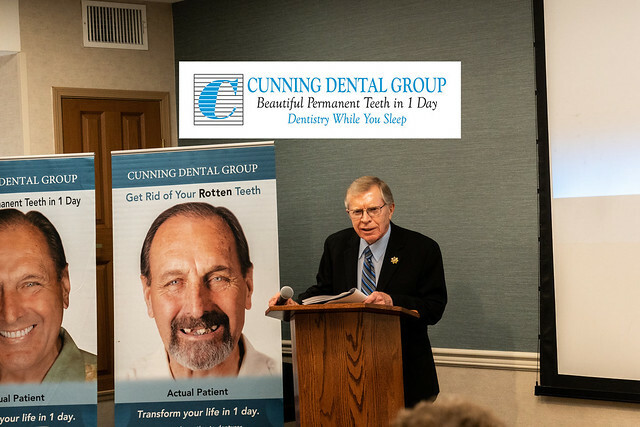 Dr. Cunning has been helping patients fix their teeth for almost 50 years. He gives advice to all the folks in attendance about getting a procedure like the Permanent Teeth in 1 Day. It’s not a simple procedure so he recommends potential patients consider the history of the office, experience of the surgical dentists and prosthodontists. If you have questions about this procedure please make sure to attend a future Teeth in 1 Day seminar since Dr. Cunning is holding these popular seminar a few times a month. The seminar featured 3 actual patient testimonials that shared their dental story. The common theme is that they didn’t think there was any hope for them. Steve who was losing a lot of teeth due to cancer treatment medications thought there was no hope? What was he going to do? You have Doreen whose teeth kept falling out and when she went to her local dentist their doors were shut and the business had closed. What was she going to do? And lastly, poor Monica with her teeth protruding and teeth falling out, she refused to show her teeth in public. What were they all going to do? Luckily, they found out about Dr. Cunning and the Cunning Dental Group. With dental offices in Montclair & Irvine they were all able to fix their teeth. They all now have beautiful, new fixed teeth. When you attend a live seminar you get the opportunity to see them and their beautiful smiles up close. None of them are hiding their teeth any longer. Are you next? Call us at (855) 328-6646 or schedule an exam online! Since the Irvine location is so close to Laguna Woods most of the patients that attended the seminar also schedule an exam there. Dr. Javid, Treatment Coordinator Mariana and the rest of the seminar support team were on hand to answer questions, meet everyone and help them make an exam at the Irvine office. The nice thing about Cunning Dental is that they are a full-service cosmetic dentistry practice so they can offer a wide range of dental treatment options like full mouth reconstruction, dental implants, dental crowns, dentures and much more. If you need a whole new set of teeth or just 1 dental implant in Irvine then call them today at (855) 328-6646 or schedule an exam online.